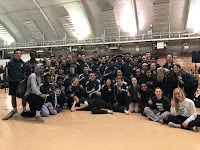 The JMM track and field team headed to Baraboo High School Friday night for a relay event where we were able to really show case our team depth. Most events featured 3 - 4 teammates working together to score in one event for the team. Both the girls and boys squads competed very well scoring point in various events. The girls finished 4th with 77 points and the boys finished 4th with 74 points. Teams finishing in the top three earned medals. On the girls side they were led by 1st place finishes in discus by Corinne F, Jessi F, and Christina M, and the Sprint Medley Relay by Anna H (200), McKenna G (200), Sara P (400), and Hannah L (800). 3rd places finishes came in the 100m dash by McKenna G 12.9, the Hurdle Shuttle of Natalie S, Margot W, and Phibi M, Shot Put by Corinne F, Jessi F, and Claire F, and Triple Jump by Kayley A, McKenna G, and Margot W.
On the boys side they finished 2nd place in the 4x800 with the team of Jordan B, Andy R, Tyler M, and Josh P, and in the Distance Medley Relay by Kaayvon GH (400), Sam B (800), Hunter H (1200), and Jonah W (1600). 3rd place finish in the 4 x 100 by Alex K, Daurice F, KeYaunne B, and Javaughn S and the throwers shuttle of Rob S, Ryan B, and Cameron N.
The coming weeks are very busy for all athletes and coaches. It is important that all athletes know which meets they are competing at this week and communicate. We are down to the final weeks of the season and want everybody to get the most out of every remaining meet and practice.